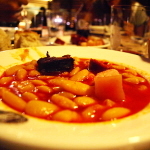 Mar i Muntanya is a typical dish that you often find on Catalan menus. Meaning ‘sea and mountain’ it involves fish or seafood matched up with something meaty. It’s the Catalan version of ‘surf and turf’ or, more likely ‘surf and turf’ is the American version of Mar i Muntanya. 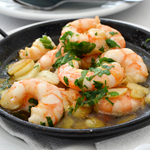 Chicken and prawns is a classic but it can be any mountain and sea combo. 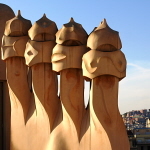 For me it also represents the diversity and imagination that seems to be second nature in Catalan kitchens. The ‘muntanya’ representing the hearty, honest fare from the hills and mountains, designed to fill you up and keep you warm. Whereas the ‘mar’ reveals the lighter, more artistic touch of a playful and delightfully unpredictable sea. The last couple of times we were in Catalonia we were lucky enough to have our tastebuds treated to the pinnacle of creative Catalan gastronomy in the Cellar de Can Roca and from the magical hands of Ferran Adriá. 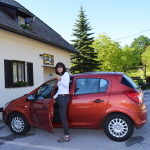 This time we were walking between villages in The Pyrenees checking route directions for Inntravel. We expected hale and hearty mountain fare to accompany us. But this is Catalonia; The culinary journey that followed the route of our physical one turned out to be just as imaginative and, if anything, more surprising. 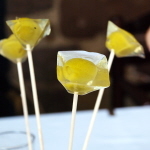 We’ve previously dined at Cal Sastre beneath Santa Pau’s medieval arches and knew that the food on Jesús Pont’s tables was as mischievous and appealing as the permanent twinkle in his eyes. Two gourmet nights confirmed he hadn’t lost his ability to surprise. His famous cannelloni was as scrumptious as ever and the home-smoked salmon reminded us just how tasty a fish salmon can be; smoky aromas swirled around the mouth with each bite – closing my eyes, I was in the smoke-house with the fish. Each imaginative course came with an explanation otherwise we’d never be able to identify the blockbuster cast of flavours. Amidst an almost overwhelming parade of wonderfully inventive dishes, one stood out; foie with the lightest violet marmalade. I’m not a big foie fan but the addition of the violet marmalade elevated it to wildly heady new heights. Conclusion: The food at Cal Sastre is akin to frollicking in the waves. Definitely more mar than muntanya. Ramon Pau at Els Cacadors is another one of those immensely likeable and passionate Catalans. The restaurant at Hotel Els Cacadors draws in the locals as well as feeding guests. Although Ramon himself describes his food as traditional, it occasionally veers into a more creative arena. 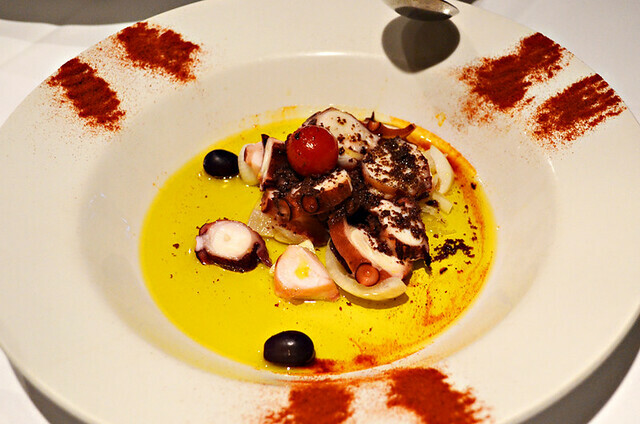 So whilst you get filling starters of seafood cannelloni in a rich cheese sauce, there’s also the lighter more artistic octopus and onion salad; Main courses consist of what’s fresh in the area which could be smoky barbecued lamb chops, crispy-skinned trout, battered hake with calamari… or colt. Yes, you read that last one right. Conclusion: Els Cacadors climbs those culinary mountains but every so often there’s an inviting sea pool. Muntanya with a hint of sea air. The ingredients were familiar, but the presentation revealed the influence of the tramontana (the wind that some says fuels creativity) so that the gazpacho is made from strawberry and melons and comes with a mussels in saffron sauce ‘shot’; the duck in pear sauce has a light curry flavour and meatballs come decorated with squid triangles. A glass of chilled, creamy potatoes with mushroom breadsticks was a revelation. Waiting to see what each dish consisted of was like waiting for fashion models to appear on the catwalk. Conclusion: Dining at Grévol was like lying on an airbed letting our fingers drift in cool waters. No question about it – mar. More amicable hosts and generous portions. There’s little finesse about the food at La Coma; it’s designed to give you enough fuel to scale the steep slopes out of the picturesque valley in which the hotel sits. Meat, lots of it, figures highly with veal steaks, beef stews, lamb chops, butifarra sausages and mixed grills making up the bulk of the main courses. 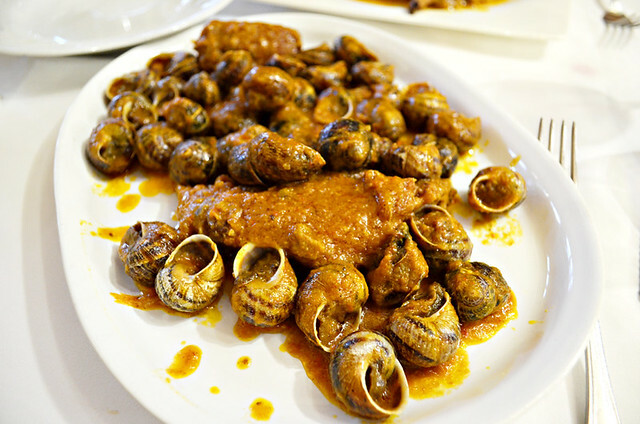 Some dishes, such as rabbit with snails, remind you how close to France you are. Conclusion: There was no danger of us leaving the La Coma dining room feeling as though we could squeeze in a bit more. Muntanya and more muntanya. 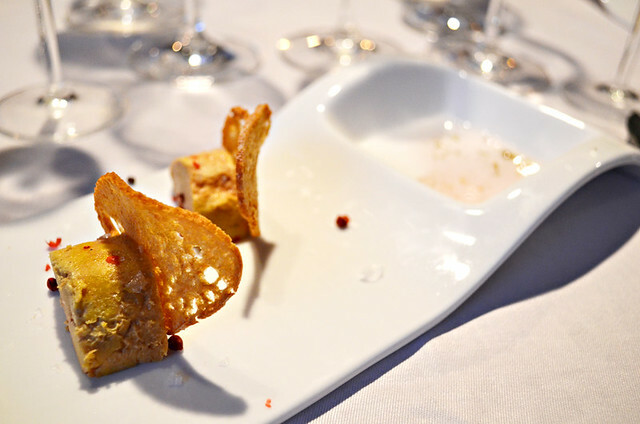 Located in a traditional Pyrenean village, the food at Hotel Calitxo was another Catalan delight, revealing a contemporary sophistication that we didn’t expect (you’d think we’d have learnt about Catalonia’s ability to continually surprise by now). 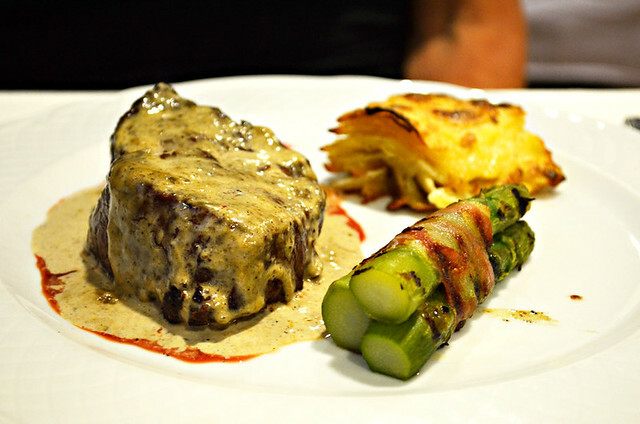 Sirloin steak in a mushroom sauce with asparagus wrapped in crispy bacon may sound typical meaty, mountain fare but was light and tender, the meat falling away almost as easy as the flakes of a perfectly cooked fillet of fish. 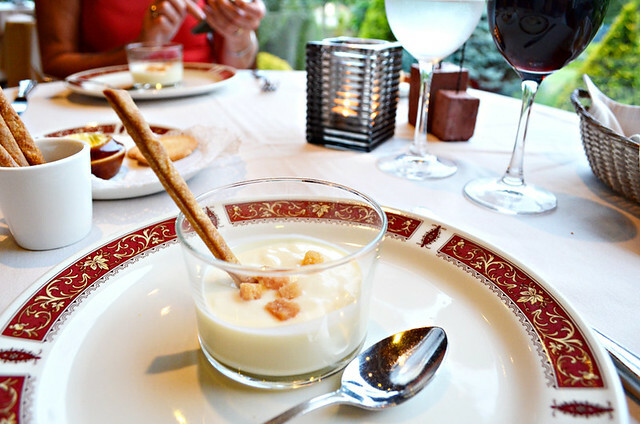 Highest on the yum factor was melon soup with goats’ yoghurt, mint and Iberian ham. Conclusion: Even though we were in the mountains, I could hear those waves crashing onto the shore. Mar with maybe a little hill behind the beach. 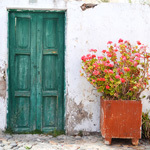 There are some destinations where you feel you’ve experienced the full range of their gastronomy within a week. Every time we come back to Catalonia we’re faced with different dishes and we leave feeling there’s much, much more for us to get our teeth around. 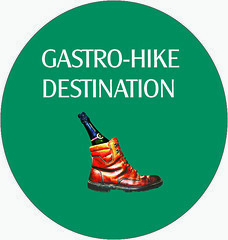 It’s simply one of our favourite gastro-hike destinations.